The Sofitel Legend Metropole Hanoi serves the dual role of being both a historical landmark and a luxury hotel. Opened in 1901 by two French investors, the French colonial-style hotel soon became one of Southeast Asia’s most iconic hotels and today is the oldest continuously operating hotel in Vietnam, This grande dame has not rested on her legendary laurels but continues to modernize and innovate, undergoing massive renovations over the past few decades, including the opening of an award-winning spa in 2009. 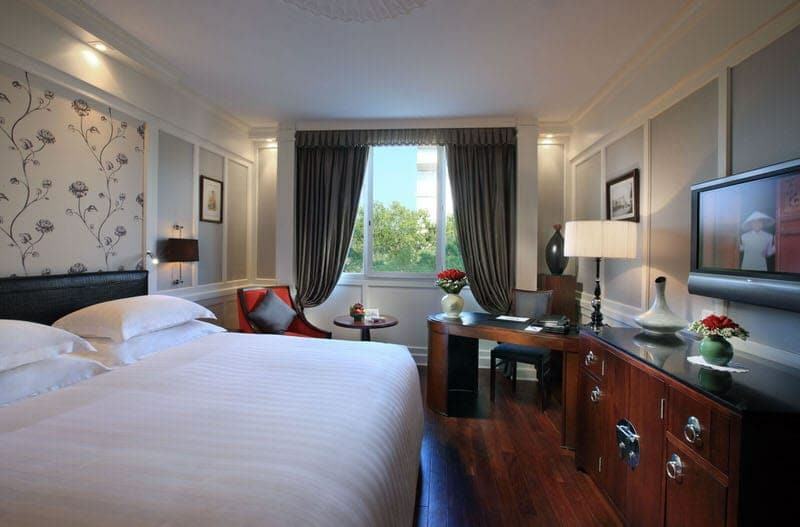 Honored to be the first Sofitel Legend property (only a handful of Sofitel properties carry this distinction), the hotel offers three restaurants, three bars, seven function rooms, an exclusive Club Lounge, a heated swimming pool, a health club, and the luxurious Le Spa du Metropole. 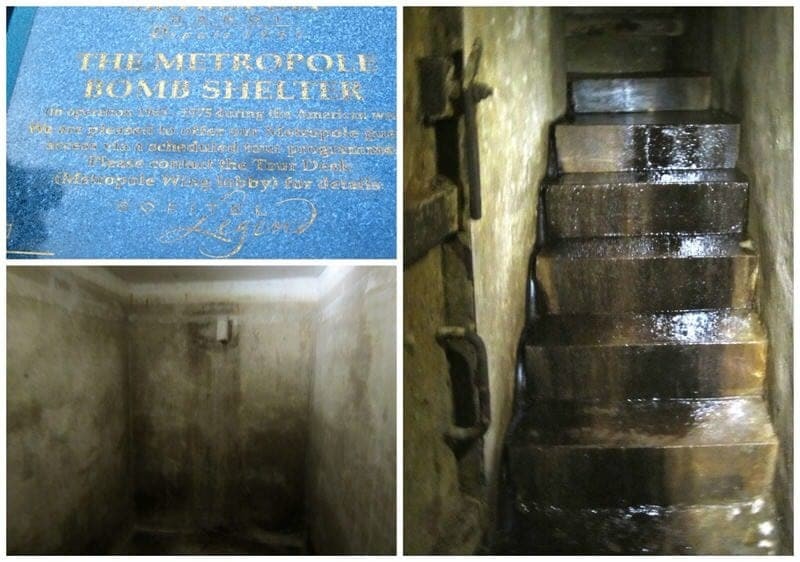 A unique offering by the hotel is a daily guided Path of History tour that provides guests with not only an opportunity to learn more about the hotel’s history but the chance to visit the recently rediscovered hotel’s war-time air raid shelter. What more could you ask for? 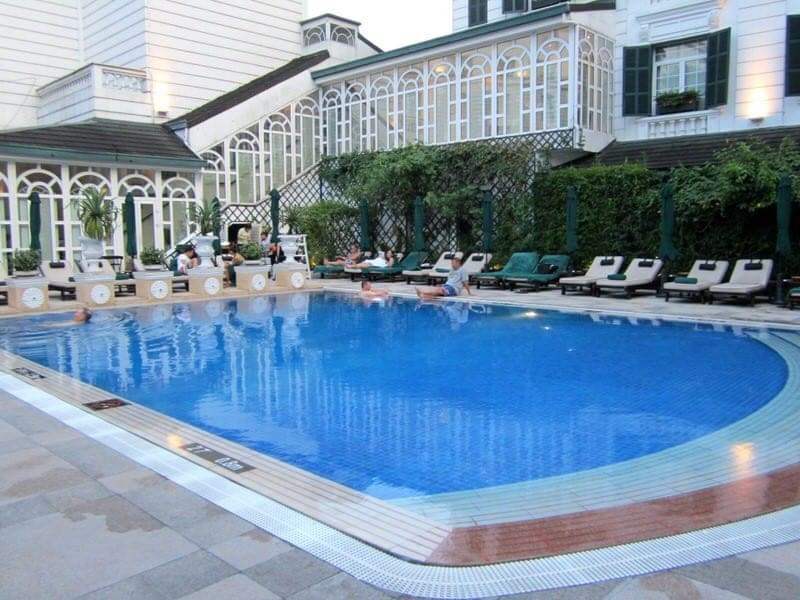 We’ll review our recent stay at the Sofitel Legend Metropole Hanoi and we’ll also give you some reasons you might want to consider spending the night. 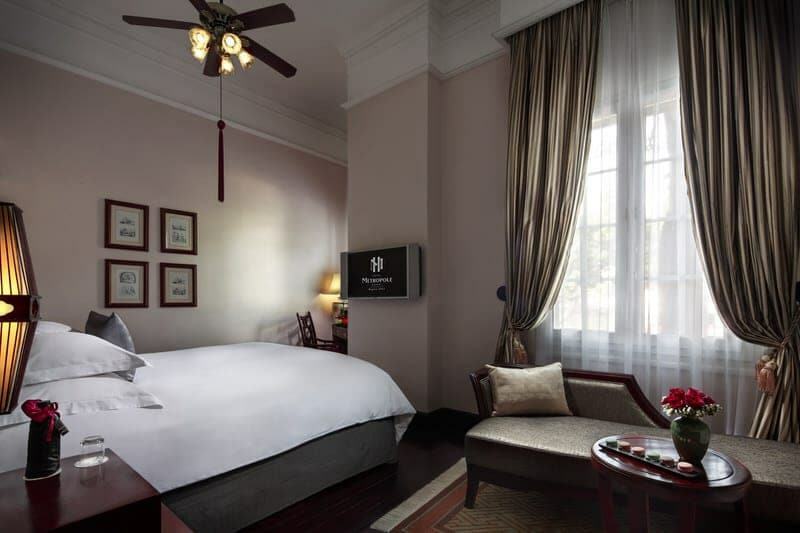 Getting here: The hotel is located next to the Opera House in the French Quarter of Hanoi. 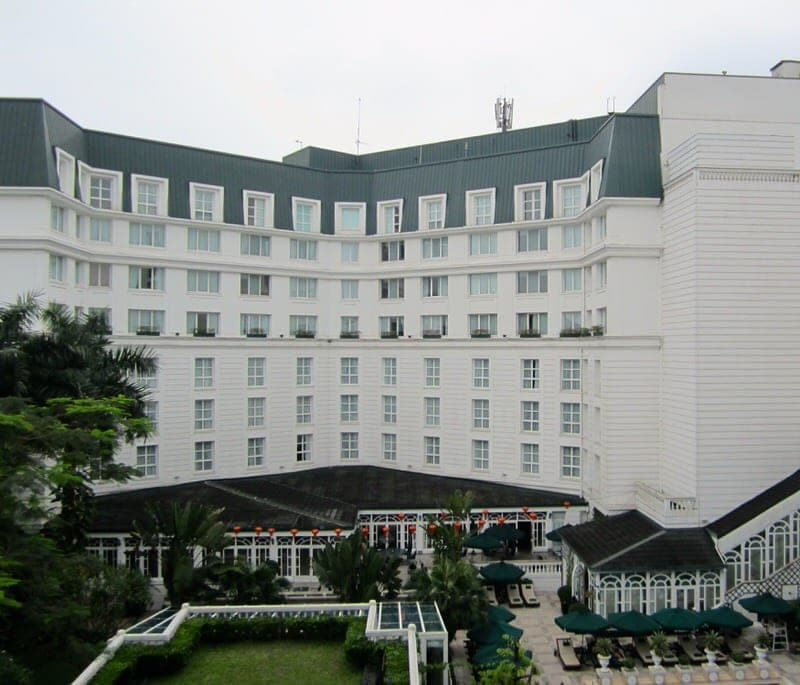 It is to the east and within walking distance of the Hoan Kiem Lake. Airport: The closest airport Hanoi Noibai is located about 22 miles (35km) from the hotel. You can arrange your own transportation to the hotel once you arrive by minibus, taxi, or public bus (expect a long ride on bus) or reserve shuttle bus service by minivan (6 times per day) or limousine through the Sofitel Metropole. We took the Vietnam Airlines Minibus ($2/person) but then had to take a short taxi ride from the drop-off in front of the Vietnam Airlines office to our hotel. A direct taxi is a quicker option, taking about 45 minutes and should cost about $13-$16 (try to get an agreed upon flat fee if you can). Just note that taxi scams are common in Hanoi so booking via your hotel can be a safe bet and take rides only from reliable companies (Mai Linh and Vinasun were the two we used in Vietnam). Bus: The local buses are a very cheap but potentially uncomfortable option (be prepared to stand and perhaps not have A/C). Get a public bus map and some lines that stop near the Sofitel are 2, 9, 34, 23, and 45. You can ask the driver or other passengers the best stop for “Hanoi Opera “and/or “Sofitel Metropole” hotel if not sure from map. Train: The Hanoi Railway Station (Le Duan Street) is located about a mile (2 km) from the hotel and you can get from the station to the hotel by taking a short taxi ride or by taking a public bus. Driving: I don’t recommend driving yourself while in Vietnam as the traffic is quite chaotic and I believe it is illegal for those without a Vietnamese license to operate a car in Vietnam (but you can rent a car if you hire a driver as well). That said, if you do have a car or motorbike, public parking is available near the hotel for 50,000 VND per car. Room cost: Room pricing ranges widely and depend on the season, starting at about $180 per night for the Premium guestrooms in the Opera Wing with prices going up to over $1,500 per night for the three Legendary Suites and over $3,000 per night for the Grand Prestige Suite. We arrived in Hanoi from Hue by plane, and had decided we were going to save money on transportation by taking a minibus instead of arranging a minivan through the hotel. After exiting Noi Boi airport, we were soon propositioned by numerous taxi drivers but we kept walking to the left to where some minibuses were sitting. We had asked at the Information desk about the Vietnam Airlines minbus and went to the spot they had directed us. The minibus didn’t leave until it was full and then begun dropping passengers off once in the city. We were lucky that at least one of the other passengers spoke English and was our advocate to the driver to make sure we got off on the best stop (last stop near the Vietnam Airlines office). 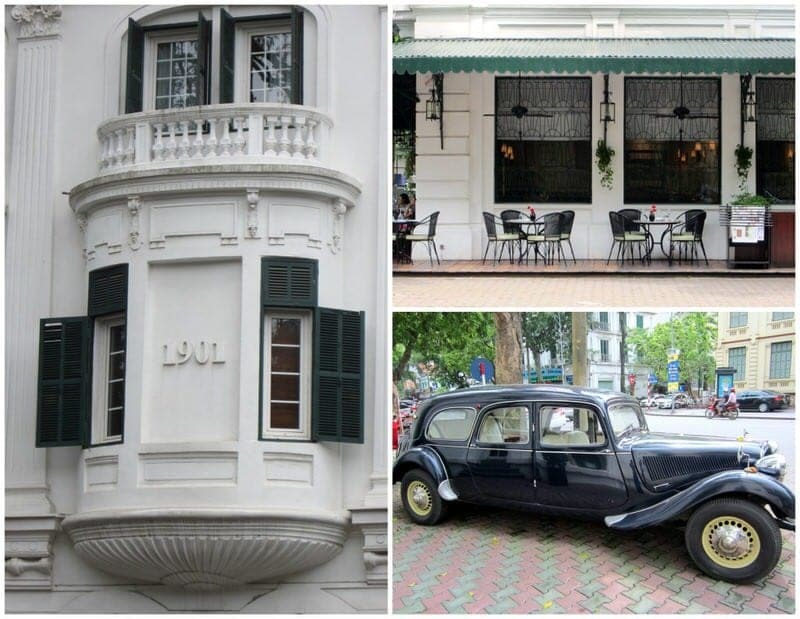 He got off at the same stop and we shared a cab to the Sofitel Legend Metropole Hanoi which was only a couple of minutes drive away. We assumed that the man was going to the Metropole as well, but it turned out he was just dropping us off on his way to his own hotel. A very kind man and a great welcome to Hanoi! We walked past one of the hotel’s vintage Citroen Traction cars (you can rent these French classic cars with a chauffeur for a city day tour), and entered the Lobby in the Historical Wing of the hotel. We were greeted and led to two chairs near the check-in desk to be checked into the hotel. It was nice that we didn’t have to stand in a line with our luggage but were able to sit and complete the check-in process. We were then led upstairs to the third floor to our room. 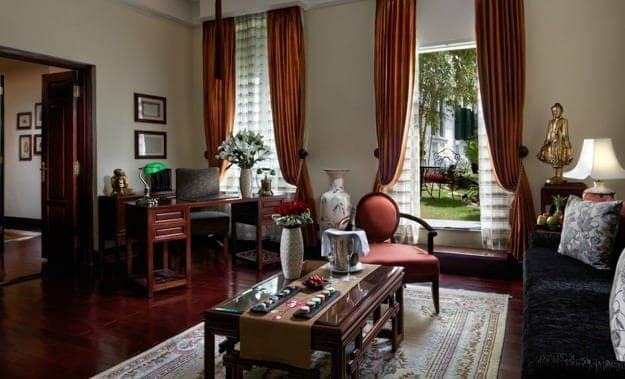 The main reason I wanted to stay at the Sofitel Legend Metropole Hanoi is that it is a heritage property, so I of course wanted to stay in a room in the Historical Wing. We were given a Grand Luxury room (Room 317). When entering, Ethan and I were both very struck by how spacious the room was as the bedroom area was huge and the bathroom was also very spacious. Many historical properties tend to have fairly small rooms so this was a welcome surprise and the room was certainly much roomier than the small guesthouse rooms we’d experienced the few days prior to this. Now, we were told that this room is slightly larger than some of the other rooms of the same class because it is a corner room, so just note you may want to request this room if you are looking to book a Grand Luxury room. The decor was very tasteful and elegant, contemporary yet heavily influenced by classic French architecture and design. The bed was large and comfortable, the divan couch was a good place for reading, the desk was conducive to blogging, and the bathtub was large and luxurious. We also enjoyed the little touches such as a note from the manager, a small welcome fruit basket that includes a note about the fruit (it was sapodilla that day), the nice toiletries, and the little treats left at turndown service (French macarons!). We also really enjoyed the hardwood floors and we may or may not have enjoyed skidding across these a few times in our socks, haha. The only complaint I have about the room is that we later learned that this room is actually not part of the original hotel that opened in 1901. Only the Historical Wing rooms on the first two floors are original to the hotel while the third floor rooms were added in 1962. Granted all of the rooms have been heavily renovated, but if authenticity matters, ask for a Historical Wing room on the first or second floors. While we spent the majority of our time in the Historical Wing, the hotel actually has 2 wings: the Historical Wing and the contemporary Opera Wing. Given that our time at the Sofitel Legend Metropole Hanoi was part work, we went on a hotel tour to take a peek at all the room types. 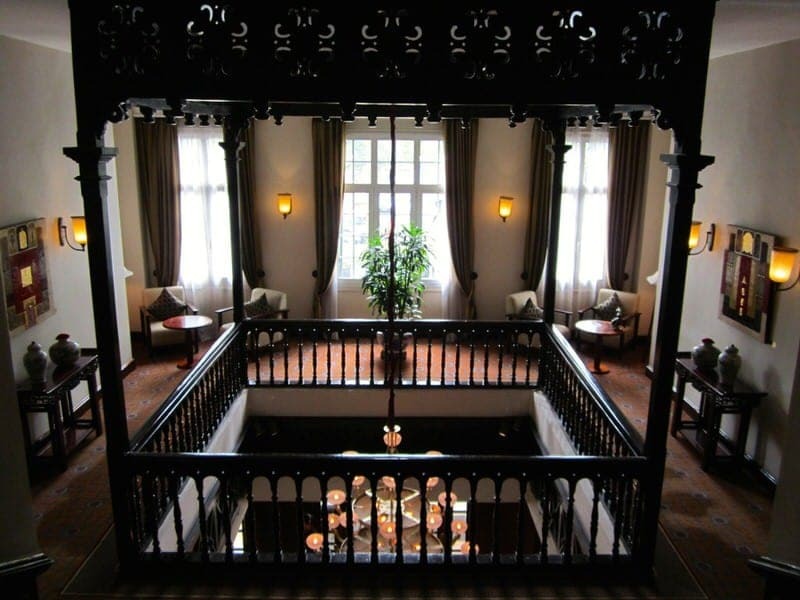 The Historical Wing has 106 guestrooms and three Legendary Suites which are suites named after a famous hotel guest (Charlie Chaplin, Graham Greene, and Somerset Maugham). We learned that the favored Legendary Suite is the Somerset Maugham suite because it includes a small private garden area. 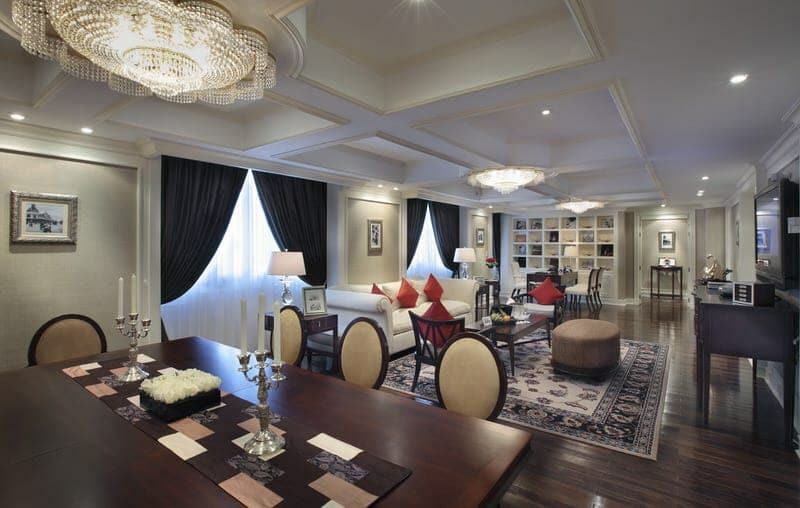 The more contemporary Opera Wing is the choice of most business and convention people as well as wedding parties and visiting dignitaries, containing 236 guestrooms, 18 suites, and the very large Grand Prestige Suite. We should note that 12 of the Premium Rooms in the Opera Wing have a small terrace. One of the many joys of staying in the Grand Prestige Suite (other than the well-stocked bar, butler services, private spa table, dining room, etc.) is that you get to read through a book that contains photos, mementos, and messages from past guests of the room which includes a long list of royalty, ambassadors, presidents, entertainers, etc. We briefly had the privilege to view a few pages from this famous guestbook. Should you choose a room in the Historical Wing or Opera Wing? I think it depends on what you want from the hotel. We were told that nostalgia-loving American, Brits, Australians, and other westerners normally go for rooms in the Historical Wing (yep, that’s us! 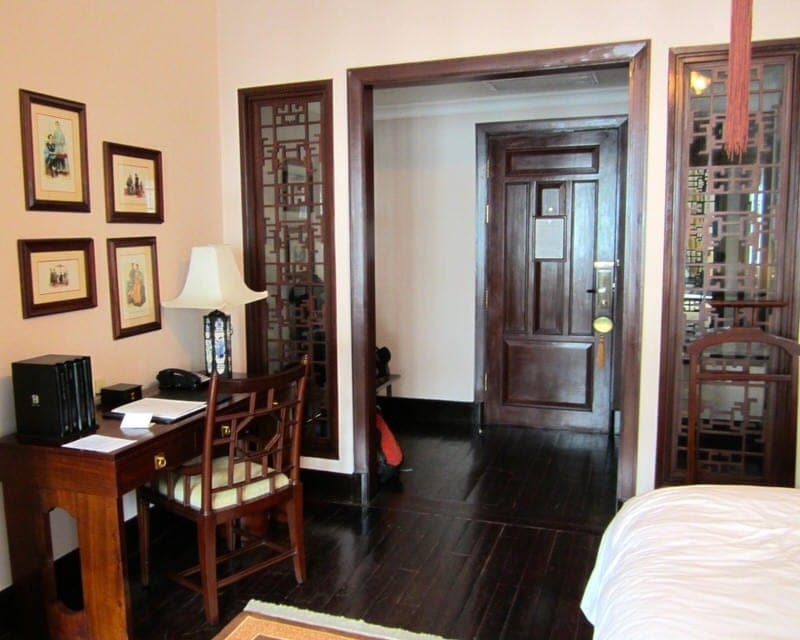 ), while Asian visitors and those visiting on business typically choose a room in the Opera Wing. We loved our Historical Wing room, but I think that at the comparable room levels, you get a better price for the Opera Wing rooms as the Historical Wing rooms are slightly more expensive as they are more costly to upkeep. If you are interested in access to the Club Lounge (offers express check in and out services, personalized services, business services, complimentary drinks, etc.) located on the seventh floor of the Opera Wing for Club Metropole guests, most of the higher priced rooms in the Opera Wing come with Club access. We did find the Historical Wing floors to be quieter as business groups were talking and meeting in the Opera Wing during the days we were visiting. I don’t really think you can go wrong though as we thought all the rooms were quite lovely. You certainly won’t run out of dining and drinking options at the hotel as it offers three well-known restaurants: Le Beaulieu (fine French dining), Spices Garden (Vietnamese), and Angelina (modern Italian) and three bars: Le Terrasse (Parisian style sidewalk cafe), Le Club Bar (classy jazz bar), and Bamboo Bar (poolside bar). For some gourmet delicacies, you can also stop in at the L’Epicerie du Metropole for snacks, desserts, and homemade chocolates and ice creams. We found out that the Metropole works with a French perfumer Laurent Severac to offer exclusive teas, honeys, massage oils, and essences blended for their hotel. 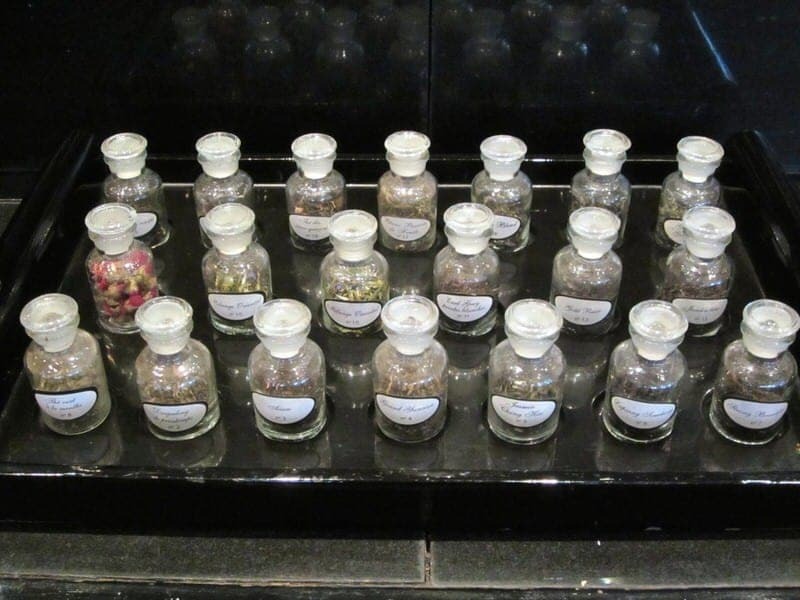 These fragrances are also used in some of the teas and spa products within the Le Spa du Metropole. Note that you don’t have to be a guest to book a reservation or have a drink at one of the restaurants or bars. The breakfast buffet came with our room rate, but we had to miss it the first morning as we were busy doing an early morning tour of Hanoi. 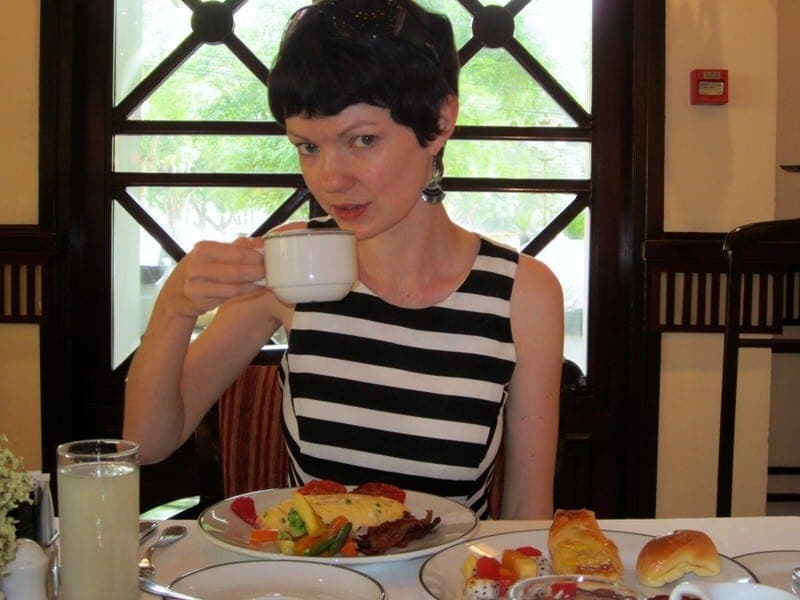 But we were very excited to sit down to a full breakfast on the second morning of our stay. We were seated, offered fresh coffee or tea and/or juice, and then told to help ourselves to the buffet. 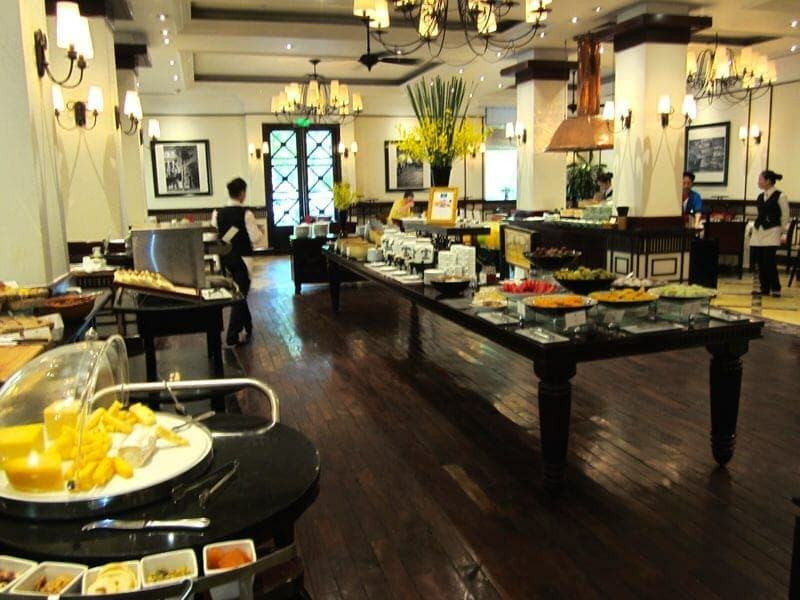 The buffet contained a large selection of breads, pastries, fruits, meats, yogurts, juices, etc., There were also made-to-order stations for eggs, noodles, pancakes/waffles, etc. which we both took full advantage of that morning. 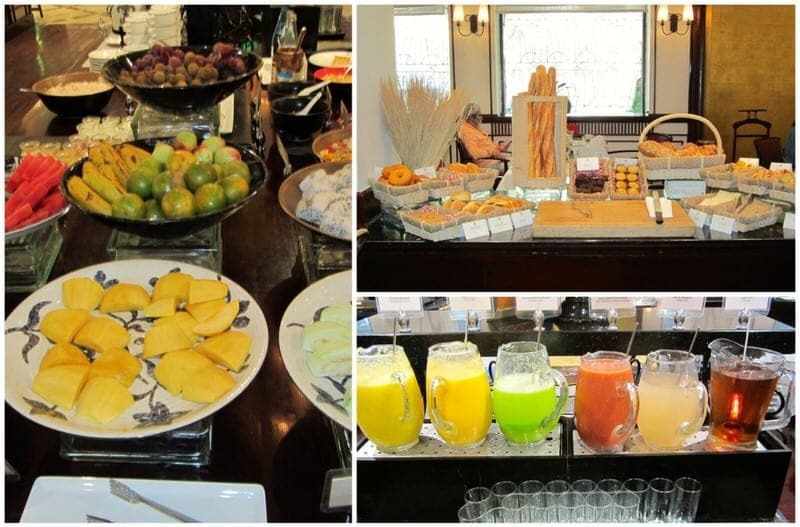 We had no complaints about our breakfast as the buffet was well-stocked and the food was great. After an hour or so of touring the hotel on foot one afternoon, we joined Ms. Ly Le, the Assistant Marketing & Communications Manager, and Mr. Lam Lo, the Online Marketing & Communications Executive, for lunch at Spices Garden. Spices Garden serves up local Vietnamese favorites from all over the country and you can either order off a menu or eat at the buffet. Ethan and I wanted to sample a number of dishes so the four of us chose the buffet. 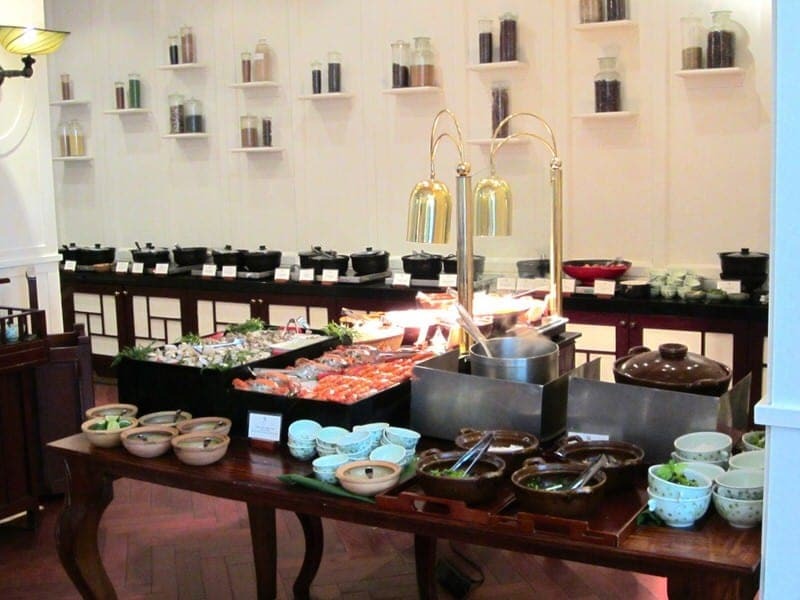 There were so many options from hot soup, meat, and noodle dishes to a buffet table filled with fresh fruits and Vietnamese desserts, They even had banh chung which is traditional Vietnamese food consumed at Tet which we had not expected to have the chance to try. Although we’d been in Vietnam for a couple of weeks now, it was so nice to have Ly and Lam explain more about the food we were eating. Everything was so delicious and we left lunch feeling stuffed from the food and pleased to have the chance to learn more about the hotel and the local food from our delightful hosts. On our final evening at the Sofitel Legend Metropole Hanoi, Ethan and I headed to Le Club for a snack and drinks and to listen to some jazz which is performed live at Le Club on most evenings. Afternoon tea and a chocolate buffet are also popular attractions at Le Club during the afternoons. 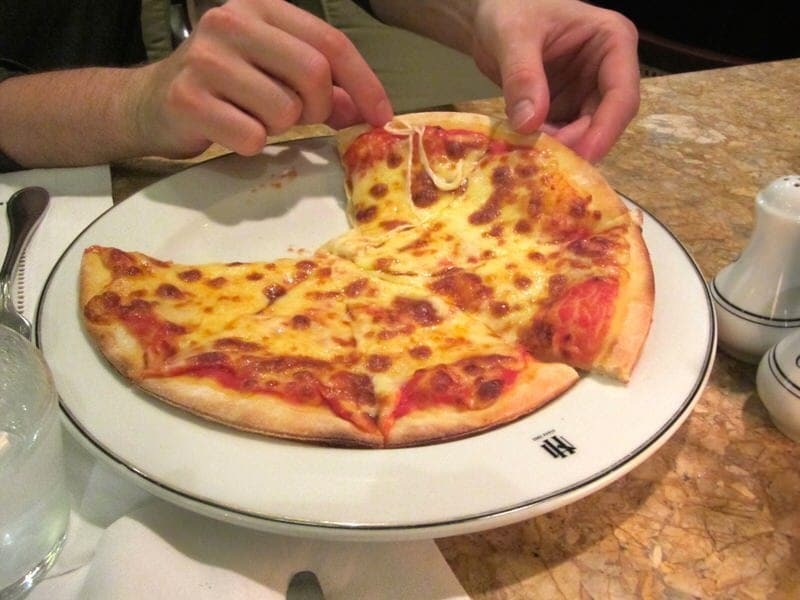 We ordered a margherita pizza to share, and Ethan also ordered a bowl of their homemade Lotus Tea ice cream. Both were great. 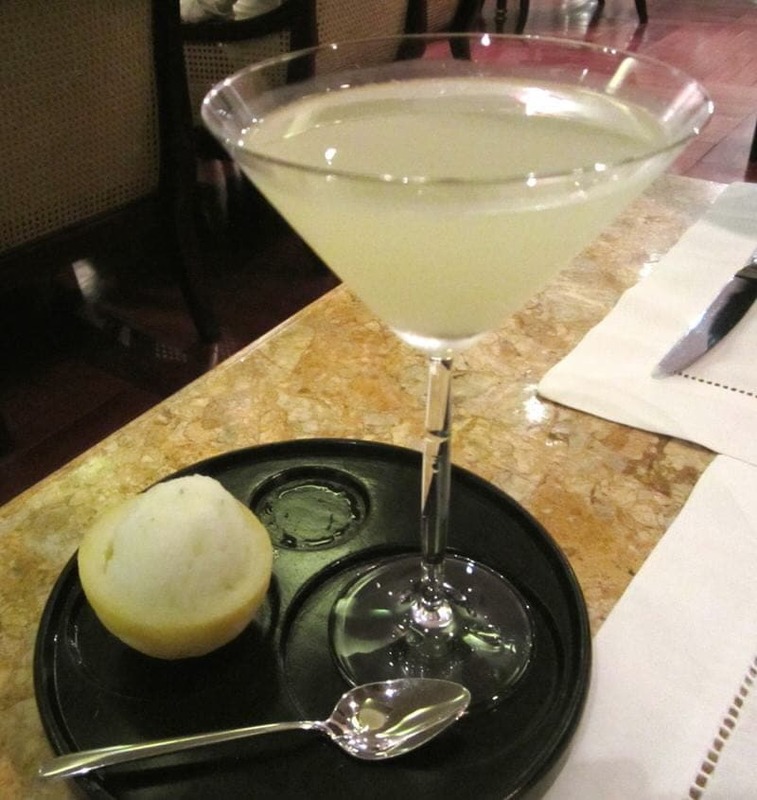 I also couldn’t resist trying the Graham Greene Daiquiri Martini. This simple green martini is made of just rum, lime juice, and sugar syrup and was the British writer’s favorite drink. I fell head over heels in love with fresh lime juice while in Cambodia and Vietnam and this drink was perfect for me. Highly recommend! 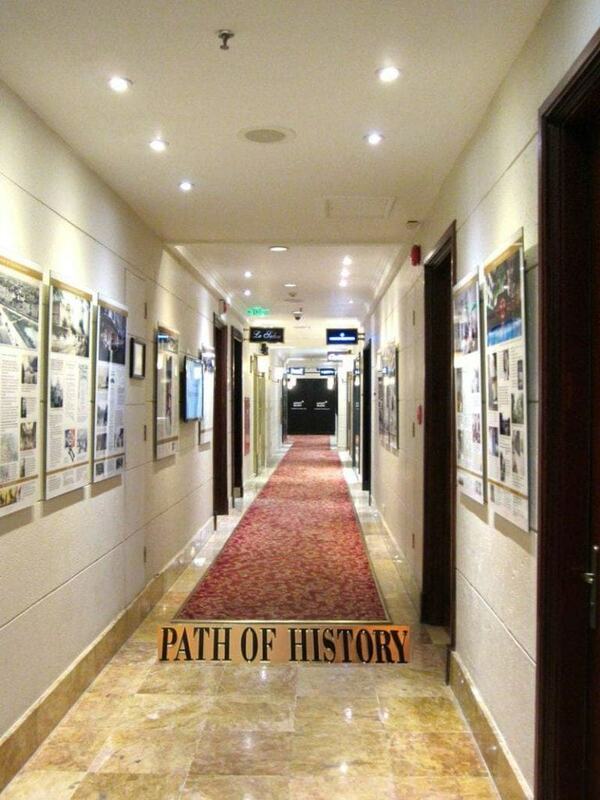 Each day, hotel guests can take advantage of the 1-hour Path of History Tour. The guided tour coordinated by historian Andreas Augustin is designed to introduce guests to the over 100 years of history associated with the legendary hotel. Ethan and I took the tour and met the guide and other tour guests in the lobby. At the beginning of the tour, our guide told us a bit about the early history of the hotel and explained some objects in a lobby cabinet such as the 1901 hotel keys and the significance of old magazine covers. The guide then takes you along a hotel corridor filled with exhibition plaques that details the history of the hotel, the war, and lists many of the hotel’s illustrious guests. Not surprisingly, the list of famous guests is very long and includes a number of world dignitaries as well as Catherine Deneuve, Roger Moore, Charlie Chaplain, Jane Fonda, Stephen Hawking, Brad Pitt, Prince Andrew, and Mark Zuckerberg to name a few. 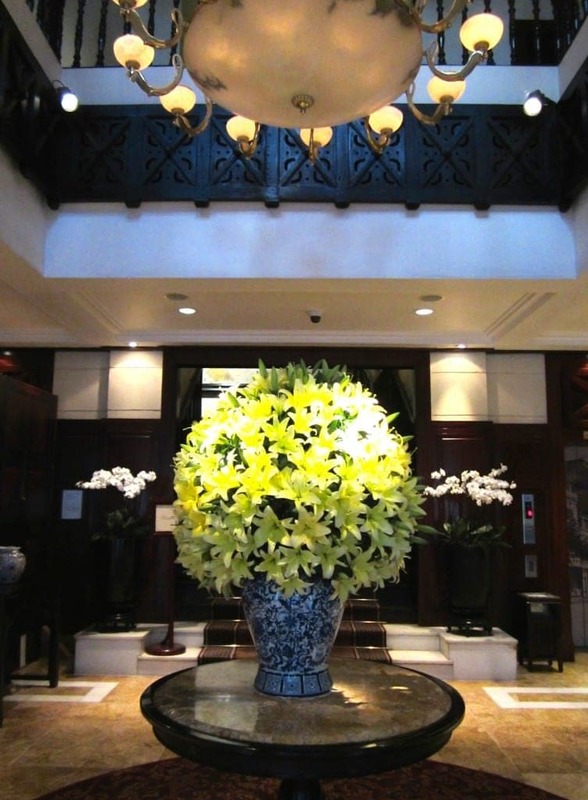 The hotel also maintains a few traditions rooted in Vietnamese culture, including the “Shining Ritual” (polishing of the Sofitel Legend name plate and bronze gong ) and the “Candle Lighting Ritual” (ceremony using the lotus lantern and the wooden fish). You may see these being performed during your stay and you should feel free to ask hotel staff to find out more about these traditions. 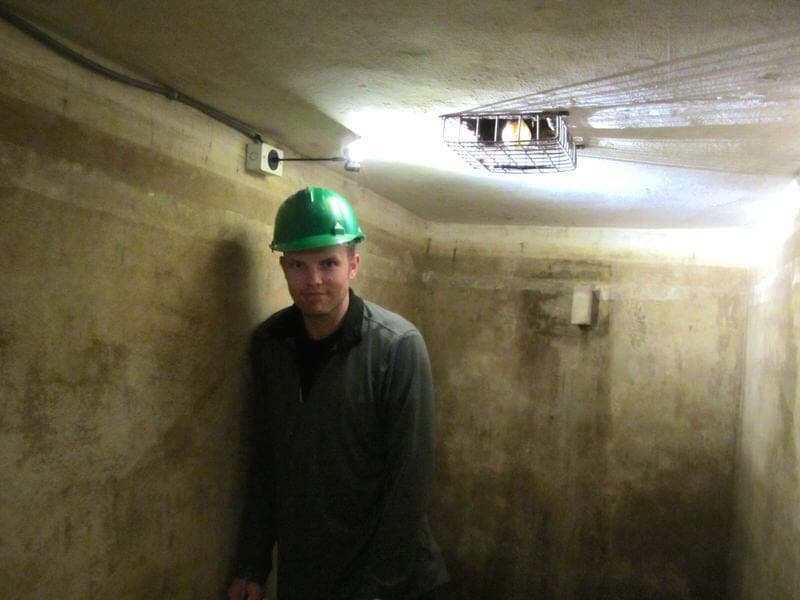 The tour ends as you descend into the recently rediscovered and reopened war-time air raid bomb shelter. 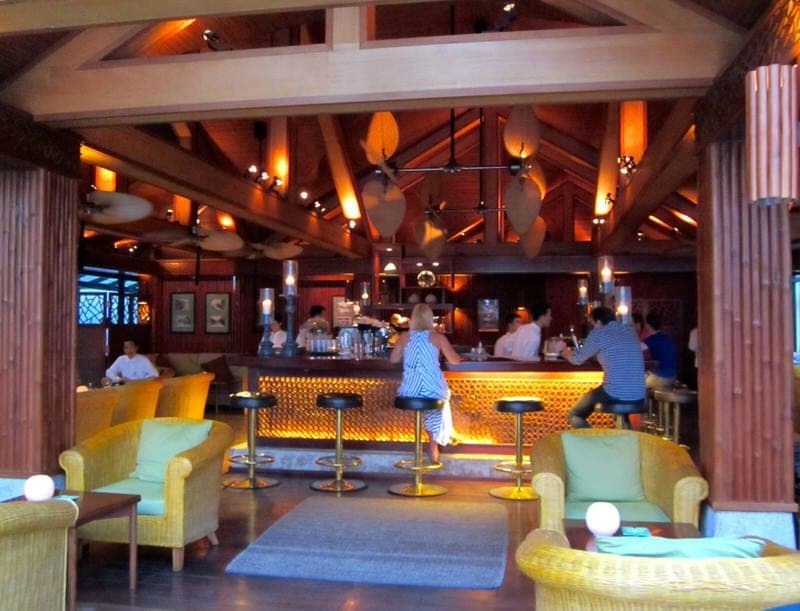 The shelter was found when renovating the Bamboo Bar and is now opened as both a historical site and a memorial to the staffers who led hotel guests to safety. As you descend into the underground shelter you see photographs of the eyes of Joan Baetz, Jane Fonda, and a young boy. During 1960’s and early 1970’s, staff members would lead guests into the 430 square foot shelter during bombings of Hanoi. Joan Baetz would immortalize her experience of spending a significant amount of time in the shelter during bombings over Christmas 1972 in her song “Where Are You Now, My Son?”. Listen to this song if you want to get a sense of what she felt being down here during the air raids. Our guide told us that while the hotel guests were relatively safe in the bunker, most people in Hanoi crouched in a concrete manhole with only a thin cover above their heads as he once did as a boy. These bomb holes were dug all over Hanoi, perhaps providing more psychological than physical protection from a bombing, and today many of these have been filled in with flowers. After the war, many people at the hotel forgot about the shelter (or perhaps did not want to remember given the bad memories of the war) and while it was briefly used by Australian dignitaries as a secret wine cellar, it lay dormant for decades. After spending a bit of time exploring the shelter and trying to get a sense of what it might have felt like to spend a few hours down there, the tour ended and we all made it back out of the cellar. A couple of the tour guests had actually left the shelter early, feeling claustrophobic in the enclosed space. We were each offered a cool drink at the top from the Bamboo Bar staff which was very refreshing. We would highly recommend the free Path of History Tour to anyone interested in learning more about the history of the hotel. We only stayed for two nights, so we can’t comment on all the various services and restaurants, but we experienced excellent lodging, food, and hospitality. 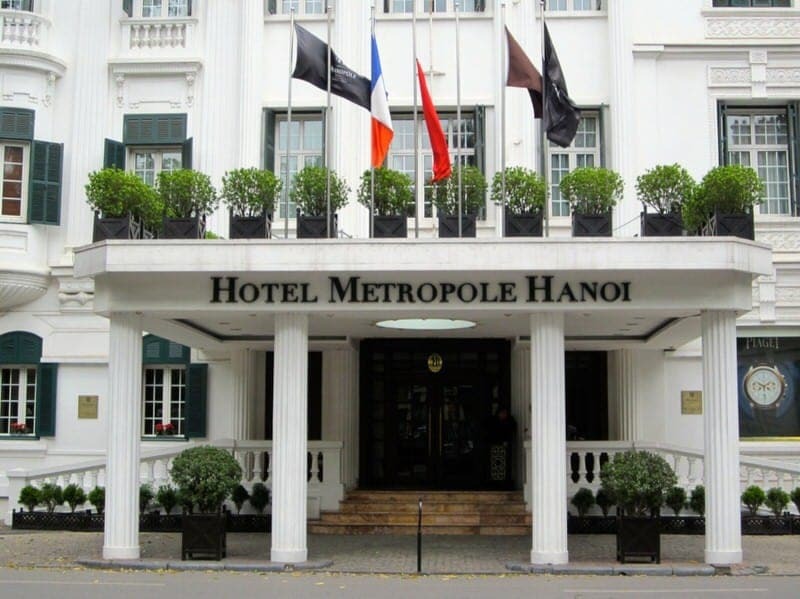 One thing that stands out about the Sofitel Legend Metropole Hanoi is that it offers a very good range of room types, room prices, dining options, and services that I think can appeal and satisfy a fairly diverse clientele. From kings to travel bloggers! 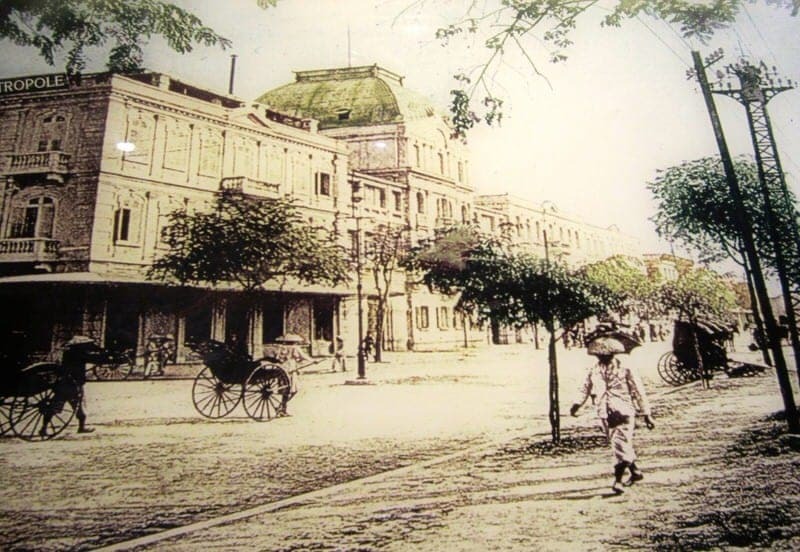 The other main unique factor is the historic nature of the hotel as it is the oldest continuously operating hotel in Vietnam. The hotel’s rich history is really its soul and keeps it from being just another nice luxury hotel. I think if it can maintain the delicate balance of respecting its history while staying contemporary, it’ll be in a good position to celebrate another 100 years of service. 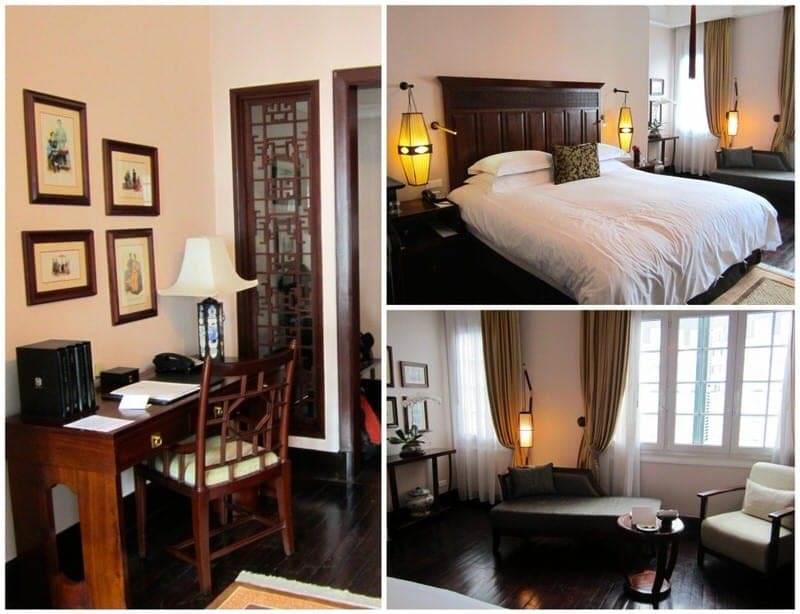 If you are looking for a luxury hotel with a historic past in Hanoi, this is the hotel for you. We hope to have the chance to return to this lovely spot in the French Quarter on a future trip to Hanoi. 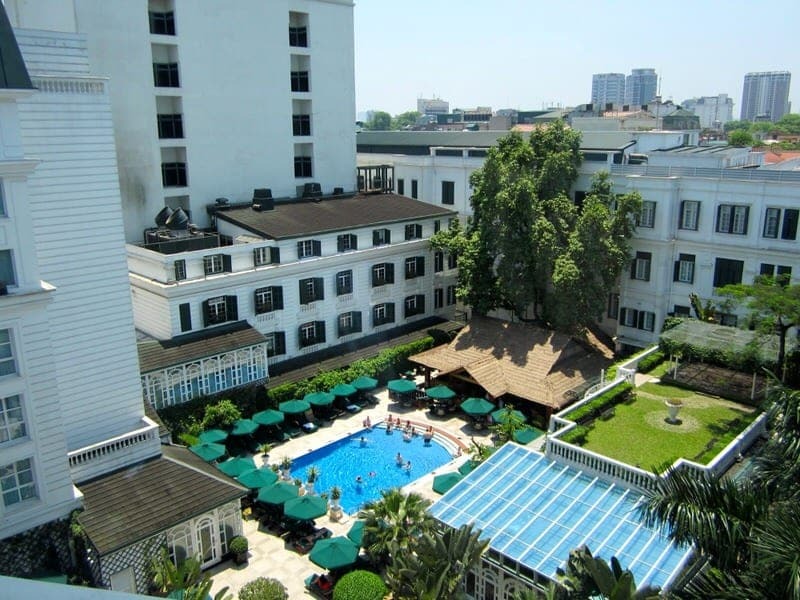 Do you enjoy stays at historic hotels like the Sofitel Legend Metropole Hanoi or do you prefer newer more modern hotels? Have questions for us about our stay or any aspect of the hotel? As always we welcome any comments or questions! What a lovely hotel. 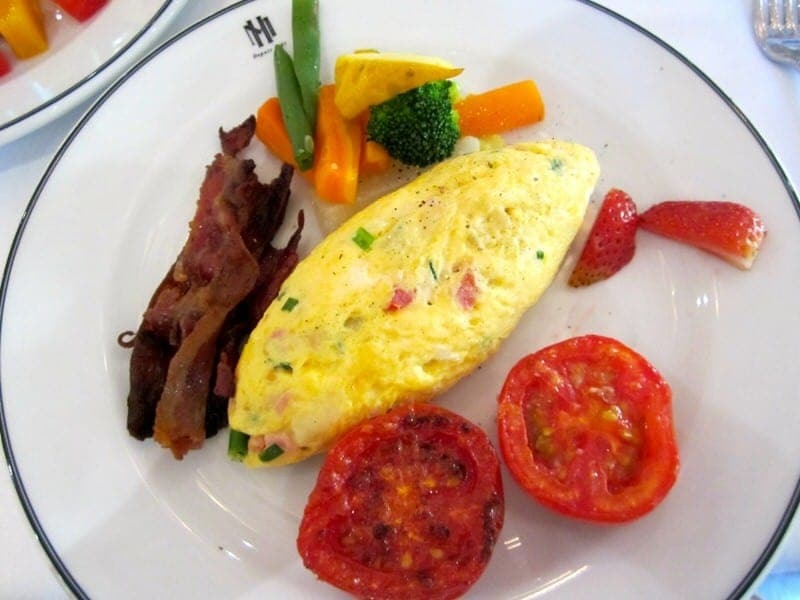 The breakfast looks yummy, hotel breakfasts are always my fave! 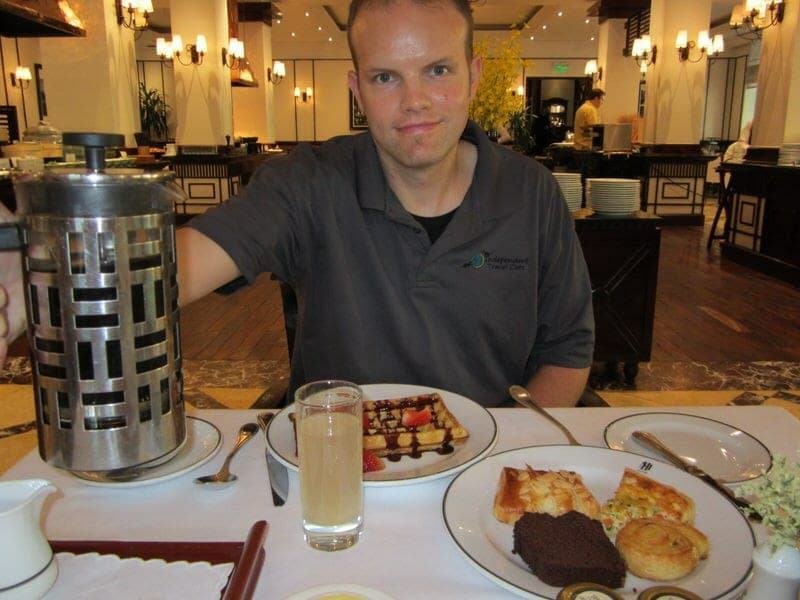 Yes, it is always such a pleasure to have a nice breakfast to start your day when traveling! wow the hotel looks amazing! And that breakfast buffet! I’d probably go there just for that! And that lunch! You always seem to be eating the best food, seems delicious! It’s pretty awesome that they include the tour as well! 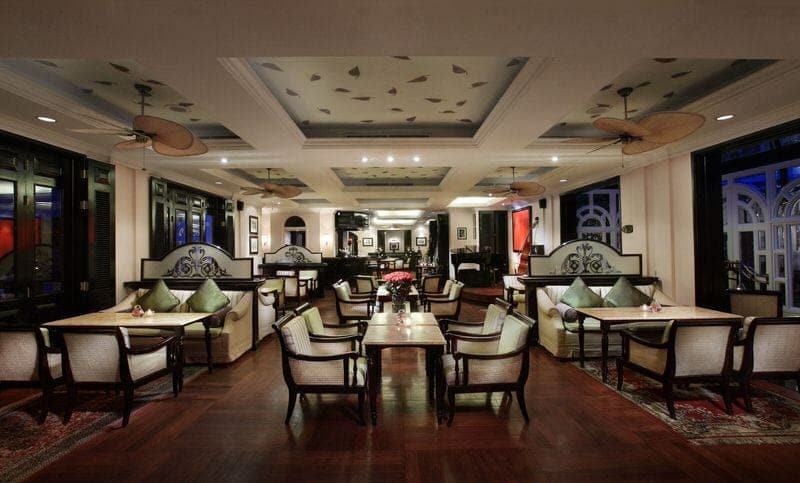 Yes, even if you are in Hanoi and are not staying at the Sofitel Metropole, I think a stop here at one of the restaurants or bars is definitely a good choice. The Vietnamese food at the Spices Garden was wonderful and the drinks at the Bamboo Bar and Le Club were great! I highly recommend the Greene Daiquiri Martini for those who like the taste of lime and Ethan really loved the homemade ice cream. Another beautiful hotel! I love historical hotels and I especially appreciate that this one offers the historical tour. The personalized touches (such as the teas, etc) really do a lot to set a hotel apart. Looks like a wonderful option! Yes, we have done a hotel tour in San Francisco at the Palace Hotel which was really fascinating, but in that case it was not run by the hotel. We were really surprised that so many of the products were homemade or exclusive to the hotel, nice touches! While a bit expensive, you can buy almost all the products to take home (teas, oils, lotions, etc.). Beautiful hotel and travel photos! New follower from the Tuned in Thursday Hop! Thanks Iva. Yes, I think it was really hard for people to remain calm in the shelter. There are a couple of chambers so they could divide people up. The guide told us that they tried to keep the more agitated people from the others to try to maintain calm in the shelter during the raids. I’m headed to Vietnam next year… great post! Thanks, and just let us know if we can help at all as you begin planning for your trip! 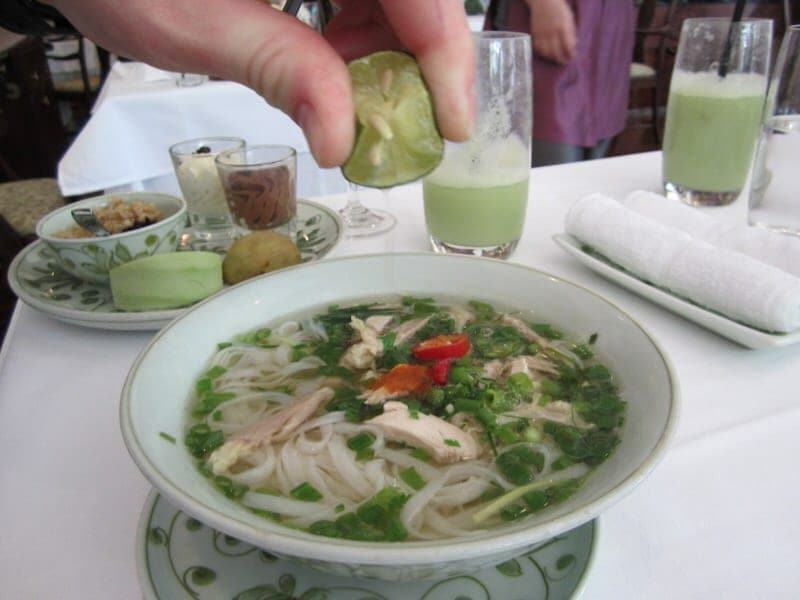 Yes, Ethan, we were being instructed on the proper way to squeeze our lime into the pho in that photo. The food at Spices Garden was really delicious. Trust some Aussies to use an old bomb shelter to store wine! This place looks fantastic. I think if I stayed I would chose the Historical Wing. I am surprised by how big the rooms are! I remember my hotel rooms in Vietnam being SO small. Great review. Yes, most of the rooms we stayed in were fairly small in Vietnam, especially at the guesthouses where we generally just had enough space to put our luggage on the floor so it was nice to have such a large room. Those Aussies and their wine; the hotel staff actually discovered this because one of the men had scratched his name into the wall and after they reopened the shelter they contacted the man and he told them they had been storing wine in the shelter. I love the idea behind the candle light ceremony! Is is something typical for Vietnamese culture? Hi Van, the “Candle Lighting Ritual” starts at 5:30pm (winter) or 6:30pm (summer) each day at the Sofitel. 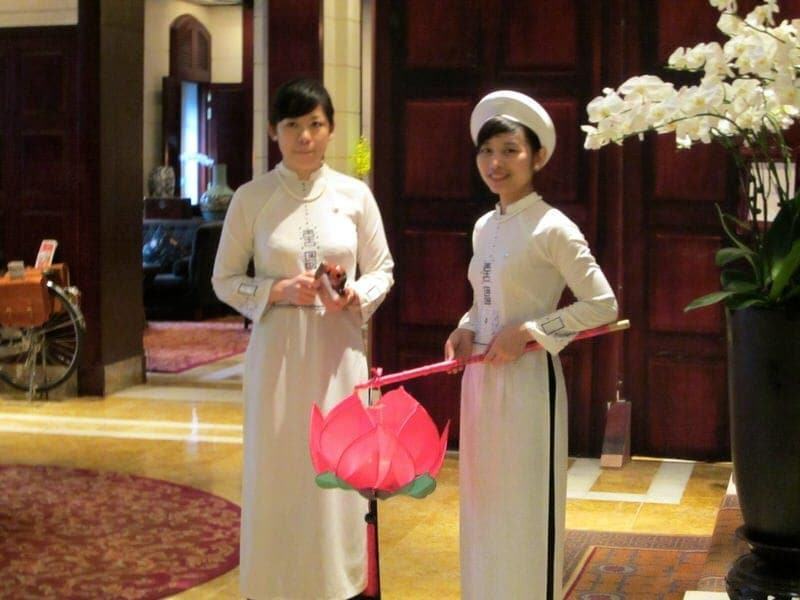 The hotel employees pictured are performing the Candle Lighting Ritual using the lotus lantern and the wooden fish (aka Vietnamese Temple Block). The lotus lantern symbolizes luxury, elegance, quality, and beauty. The wooden fish is normally used as bell in Vietnamese temples and is a musical instrument in Vietnam. The candle lighting ritual symbolizes closing off the daytime with the candle and the wooden fish awakening rhythm. Yes, even after checking out all the different rooms it would be hard for us to choose a room, both sides have their appeal! I would so want to go on a tour in the car. And I’d mostly likely watch the candle lighting ceremony every day. 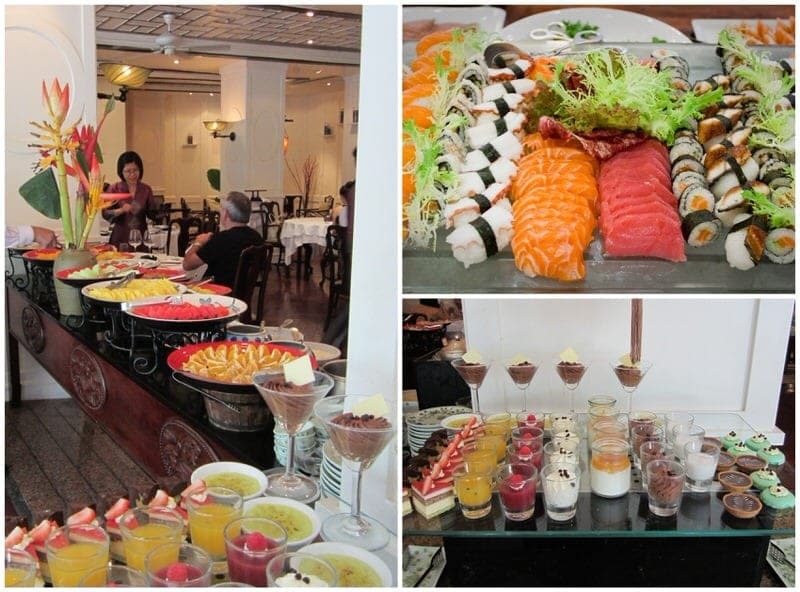 The lunch buffet looks divine! There is no way I would have gone in the bomb shelter. Thanks for commenting Carla! Yes, the car tour would have been fun, but we didn’t have time to do it. Maybe next time! Yes, the lunch was divine (recommend even if not staying in the hotel) and the bomb shelter visit is not for everyone as it can make some people feel claustrophobia as a couple of the the guests on our tour found out.